Reciprocal death sentences raging between Yemen and the United States offer a glimpse of warfare in the internet age. 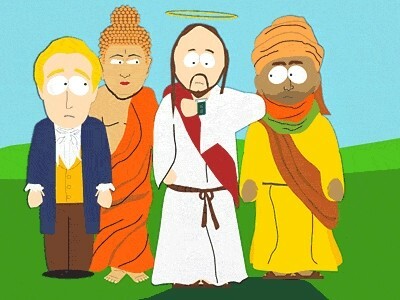 The censored cartoon of Muhammad (far right) with Jesus, Buddha and Joseph Smith. 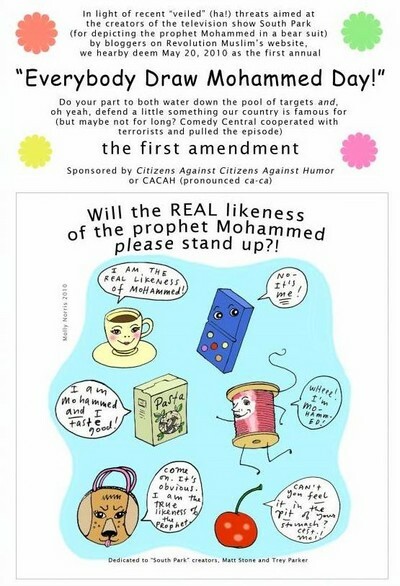 The topic opens with South Park, an iconoclastic adult cartoon program on Comedy Central, which in April mocked the prohibition on depicting the Islamic prophet Muhammad. An obscure website, RevolutionMuslim.com (whose proprietor was subsequently arrested on terrorism-related charges), responded by threatening the show's writers, Trey Parker and Matt Stone. Panicked, Comedy Central censored further mention of Muhammad. 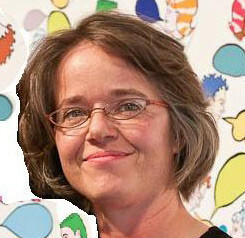 Enter Molly Norris, a cartoonist at the Seattle Weekly, who showed solidarity with Parker and Stone by posting a facetious "Everyone Draw Muhammad Day" appeal on Facebook, hoping that a host of caricaturists would "counter Comedy Central's message about feeling afraid." To Norris' surprise, dismay, and confusion, others took her idea seriously, prompting Facebook campaigns for and against her "day" and the Pakistani government temporarily to block Facebook. Norris disowned her initiative, apologized for it, and even befriended the local Council on American-Islamic Relations representative, to little avail. Anwar al-Awlaki, an Islamist leader in Yemen, responded in July by issuing a death sentence on Norris, inaccurately but pungently called a fatwa. On consulting with the police, Norris in September not only went underground but "went ghost" and disappeared entirely, including her name and her profession. 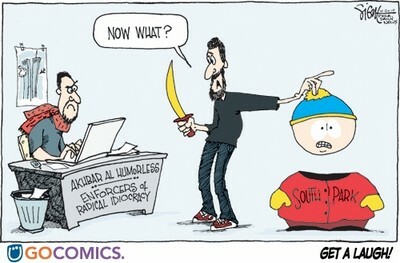 Awlaki's "fatwa" on Norris, however, is only half the story. The other half concerns a U.S. government "fatwa" on Awlaki. Awlaki was born in New Mexico in 1971 to well-connected Muslim Yemeni parents. His father, Nasser, studied and worked in the United States until 1978, when the family returned to Yemen. Anwar went to the United States as a student in 1991 and spent the next decade in various degree programs (engineering, education), only to emerge as an Al-Qaeda-style Islamist figure, comparable to Osama bin Laden both in his ideological fanaticism and his operational involvement in terrorism. Arrested in connection with the 9/11 attacks, he was inexplicably released and allowed to move to a remote region of Yemen, beyond government control, where he currently lives. U.S. law enforcement connects Awlaki to several violent attacks on Americans, including the Ft. Hood shootings, the attempted bombing of a Northwest flight approaching Detroit, and the Times Square bomber. Awlaki's terrorist record earned him a unique distinction: in April, for the first time in the nearly 250-year history of the United States, the government placed him on a "kill list," making him the only U.S. citizen to be condemned to death by his own government without benefit of a legal process. Both the military and the intelligence services are targeting him; as one unnamed official puts it, "he's in everybody's sights." The poster drawn by Molly Norris. In response, his father initiated in August, with help from the American Civil Liberties Union and the Center for Constitutional Rights, a lawsuit against the U.S. government that challenges the targeting of Awlaki as illegal. This extraordinary trading of fatwas prompts several observations. First, Norris and all Americans currently live under the "Rushdie Rules," which punish whoever disrespects Islam, Muhammad, or the Koran. Make fun of Muhammad and you're on your own. Local and national politicians had nothing to say about her plight. Journalists, usually keen to protect one of their own, went silent. No organization sprung up to raise money for her protection. Second, the internet stands at the heart of this entire episode. It turned Norris' jokey idea into an international incident, brought news of it to Awlaki in remote Yemen, and allowed him to direct his American operatives. A mere twenty years ago, none of this could have taken place. Third, the internet and Islamism have together privatized war. At will, an American living in Yemen can disrupt the life of an American in Washington State. The U.S. government has declared war on a citizen. Fourth, Awlaki is a plain terrorist, sowing death and disruption, whereas the U.S. government's "kill list" is defensive. One is evil, the other is moral. Fifth, why the inconsistency, whereby the U.S. government permits itself "targeted killings" but denies this tool to Israel? Finally, Awlaki stands at an unprecedented crossroads of death declarations, with his targeting Norris even as the U.S. government targets him. 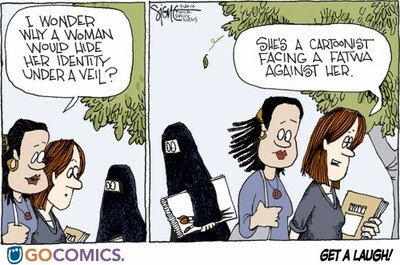 This is as startling in an Islamic context as it is in an American one. The boundaries of warfare are being stretched in novel, strange, and frightening ways. Oct. 7, 2010 update: A reader, Keith Barger, points out that at least one cartoonist, Signe WIlkinson of the Philadelphia Daily News, has stood by Parker & Stone, then Norris, signing petitions and drawing cartoons about them. I reproduce two of them here. Wilkinson stands by "South Park." Wilkinson stands by Molly Norris. Related Topics: Freethinking & Muslim apostasy, Islamic law (Shari'a) | Daniel Pipes receive the latest by email: subscribe to the free mef mailing list This text may be reposted or forwarded so long as it is presented as an integral whole with complete and accurate information provided about its author, date, place of publication, and original URL.